This year I decided to host a Christmas Eve celebration for the family. Since it is crazy during the holidays, and leading up to it, I just did not have it in me to do all the shopping, menu planning and prep it requires. My kiddos are enough work! 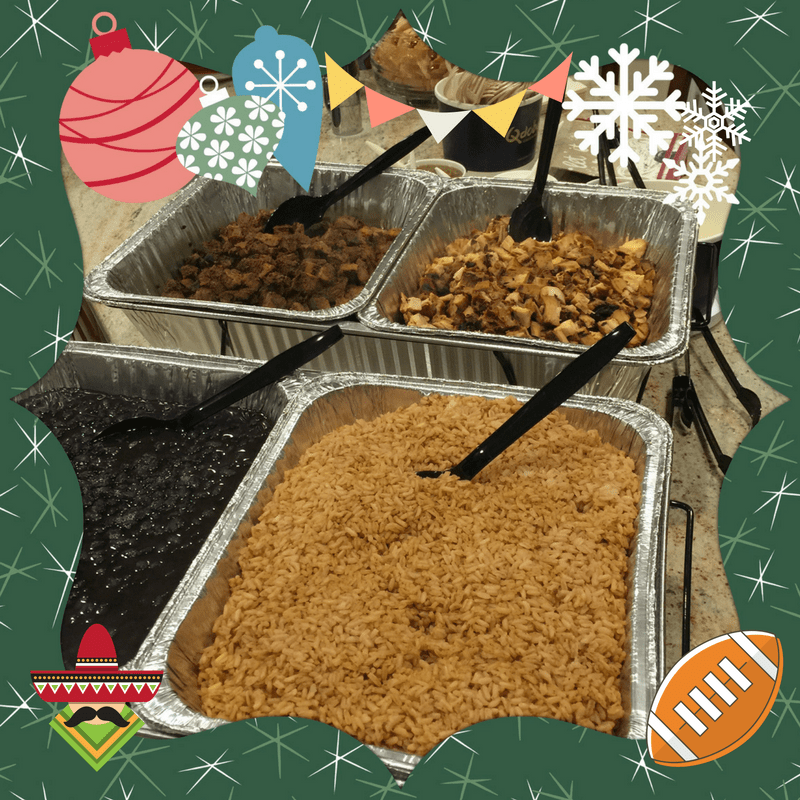 Since we received a complimentary Qdoba gift card, we decided to put it to use and try their Qdoba catering services. Why Mexican though? Well, during the holidays, we knew that we were going to eat Italian and Chinese. To keep things different, we decided Mexican would be fun. We could have Margaritas, have Tortillas and Salsa for appetizers, and then a naked (sans wrap) Burrito Bar. Throw in easy dessert, and the only effort I would need to do is vacuum before the party! Ordering was a bit more complicated than I thought though. I picked up a catering menu at our local Qdoba. It looked like I could order catering for 10. However, when we called, they told us the minimum for the Burrito bar option was 20. (Despite the menu I had picked up stating otherwise.) Plus, we could only order in increments of 5. So you couldn’t order for 12 people or 22 people. That was a big issue for us. Make sure to order catering 24 hours in advance! There is a 800 number you can call if you can get to your local store to order. We ordered the morning before our event, and it was fine. (Just don’t call day of your event.) You also have the option of ordering drinks, desserts and even some extras if you want it to be complete non-stop! As we picked up the order, it was right on time. Then we asked if everything was there. (There were bags of stuff, so make sure someone can help you out to the car!) 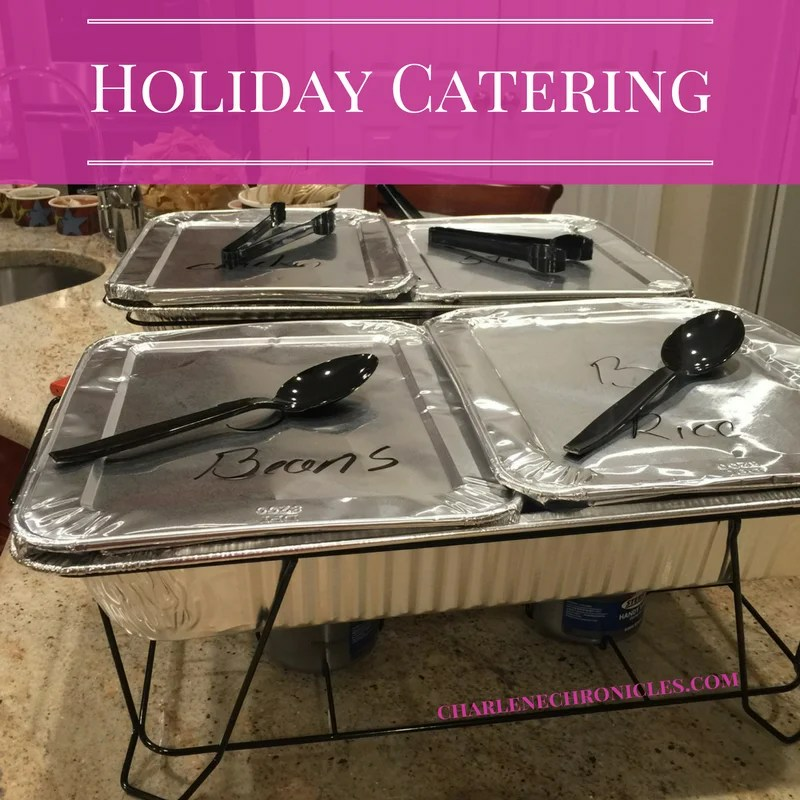 Catering includes the food, but also napkins, plates, utensils, serving utensils, etc. When we got home, it was a easy set up. However, we didn’t get napkins or plates for the chips. Plus, the dips, sauces, chips, and the like were in plastic bowls. You may want to have platters and pretty bowls on hand to transfer the smaller contents into nicer looking serving dishes. However, you get Sterno containers to keep the food trays warm. As our guests arrived, everyone raved about the set-up. We dug into the chips and salsas: mild, moderate and hot, using paper plates and napkins I had on hand. Super yummy! Then dinner was served. For the Naked Burrito bar, you get a bowl, and then fill it with rice, beans and choice of meat (chicken or steak.) You then add the included sour cream, guacamole, and shredded cheese. 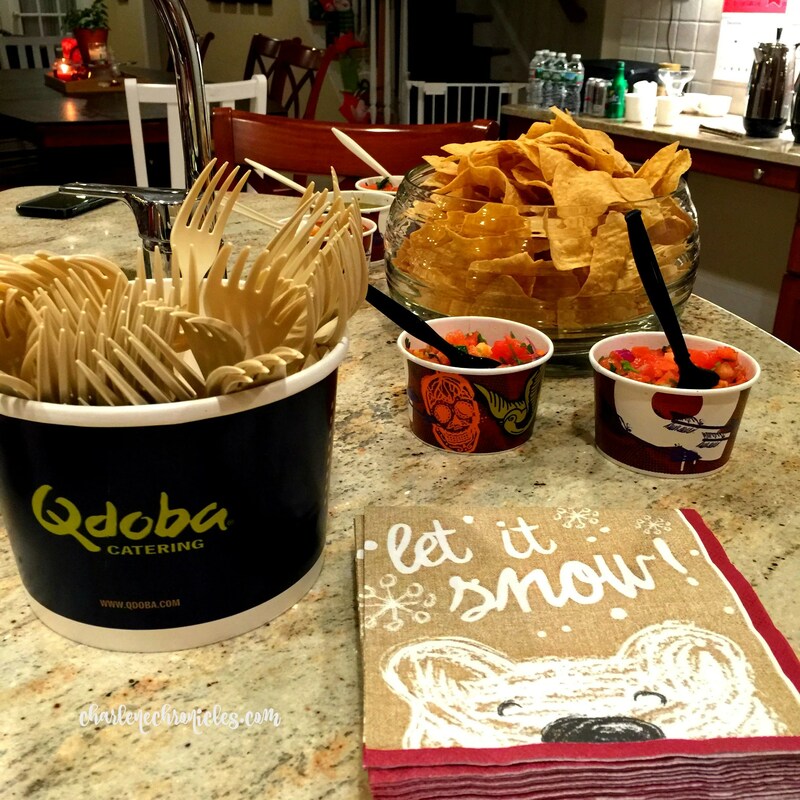 Would we have Qdoba Catering again? Yes, I think so. Probably would try the taco bar (less minimum) or invite more people over! As I write up this post, I am about to make the leftovers tonight! If you have New Year’s entertaining planned, consider making it easy (and different). Or order it for a Super Bowl party. Make sure to have Margaritas! For a virgin Margarita, that even kids would love, try this recipe! Pour limeaide, lemon sparkling water, lime parkling water and orange juice into a pitcher and mix. Fill glass ⅔ full with ice, then pour the margarita over the top. Garnish with lime. Alternatively, put the mixture in a blender with more ice for a frosty treat! Add Sombreros for the kids, if you want to play up the Mexican theme. Add embellishments on the table for kids to use to decorate the headwear for a party activity too! Also have a Pinatas, and Maracas for a New Year’s countdown! Hit the Pinatas at midnight or shake the Maracas to ring in the new year!